recover format gif from EXFAT/FAT32/NTFS hard drive system or external drive, usb drive. Gif file recovery - Recover deleted GIF Files,Aidfile data recovery software is best software for recovering gif files from formatted hard drive, usb drive etc. Use "Undelete" mode to recover deleted gif files from hard drive. Use "Unformat" mode to recover gif after format hard drive. Use "Recover partition" mode to restore gif files if hard drive partitions changed or damaged or deleted. Use "Advance Scan" mode to rescue gif files if partitions show as "raw" or recover deleted gif files which can not be found with "undelete",retrieve gif files from raw partition,rescue gif of partitons which are not NTFS,nor exfat,nor fat32. Have you ever formatted a photo from your memory card or hard drive by mistake, or perhaps unplugged your camera from your PC before it was safe to do so, corrupting the data on the memory card. 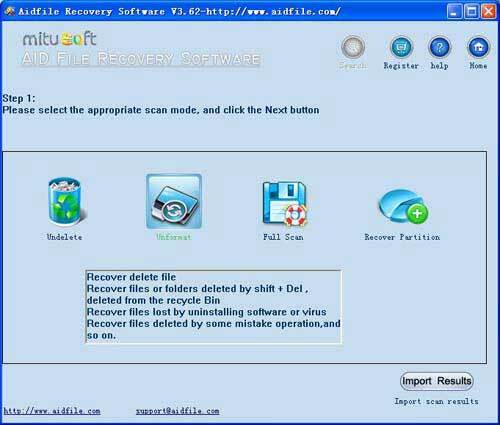 Aidfile data recovery software is an easy to use, low cost application that allows you to recover lost, deleted, corrupted or even formatted files from your camera, pc or memory card. Almost every camera make and model is supported, simply plug your camera into the PC using the cable supplied with the camera, select it using the Aidfile data recovery software, and recover your lost photographs - its that easy.